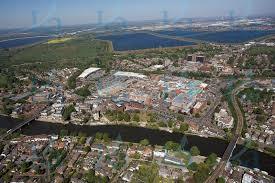 Staines has come away from the time when it was a humble Neolithic settlement. It’s over 1000 years since Staines, or ‘Stanes’, was penned in the Domesday Book, and since that time there’s been a lot added to it than the 6 mills there were in place then. There’s an ever increasing number of national and international companies that are settling in Staines, there’s many a headquarter in the town. For a day out then High street, Church Street and Clarence Street have many great shops and some really nice places to eat along the way, even for our high standards! There’s a market which is held each Wednesday and Saturday and if you haven’t been before it’s located on High Street and is as good as any. It’s absolutely heaving at the quietest of times and there’s stall upon stall of fresh, local made or farmed food. If you’re more adventurous there’s The Royal Landscape, Hounslow Urban Farm, boat trips down the Thames, Windsor Castle. Lego land and Thorpe Park do the trick for kids. 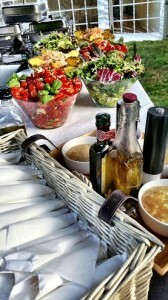 There are many parks in Staines, hotels are aplenty if you need venues for catering. Slowly but surely with our hog roast catering people are coming to Staines not just as the home of Ali G, but as the home of the most elite hog roast catering experiences. All that’s ever needed for event catering can be found from Spitting Pig. There’s no need to go anywhere else because we have everything for your hog roast Staines needs. 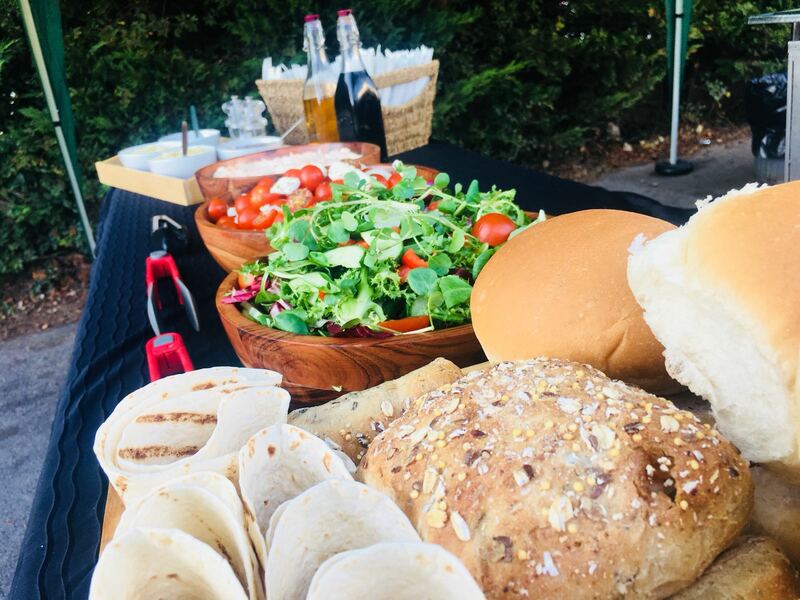 Whether you want to make your own hog roast or you want our #1 chef to do the job for you, and a whole team to provide other services at the same time, such as serving tables or offering a drinks bar for your guest, we’re the best for both. Catering is what we’ve built our name around, we’ve been hog roast catering long before we offered hog roast hire Staines The hog roast catering takes on many forms, there’s black-tie event dinner menus, there’s buffets available for any type of event, formal or informal, and there’s the simple out and out hog roast which is equally infamous for its adaptability. Now obviously, not every customer wants us to cook their meat for them. 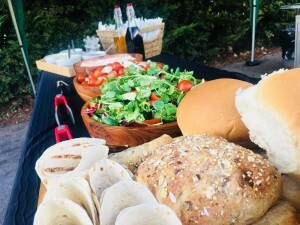 For this we have the hog roast Staines hire option where we can deliver a machine and maybe a pig if needed and the customer can test their own culinary skills and impress their guests. We arrived at the delivery address on the morning of the event and unloaded the machine before demonstrating the customer how to start it up and set it the right heat to roast the pig to perfection. We always encourage questions on from the customers just in case they are a complete novice. We showed him how to get the pig on the spit and attach it properly to the machine. Now full of confidence, he was happy for us to leave him to get on with his event so we told him we would be back for the machine in the morning. He had taken the liberty of asking a few guests to write recommendations for us to see when we arrived the next day. After reading them we weren’t shocked to see that guests had enjoyed they food. Our state of the art machines are the perfect platform to roast any meats that tickle your fancy. If you don’t like pig then before you leave you should rethink, because if you were to have a look at our menu page you’d see that we have many more spit roast options that are available. Despite the name a Spitting Pig roast doesn’t need to involve a pig necessarily, being the diverse place that Staines is we’re regularly tasked with providing different kinds of spit roasts, be it spit roasting a whole lamb, a sirloin of roast beef or a number of whole chickens. All the hog roast Staines meats receive the same excellent spit roast techniques, with the best roasting machines used to cook them. A roasted pig tastes extra delicious because of the self-basting process which the rotating skewer promotes, but the principle is the same for any meat, whether turkey, chickens or a chicken kebab. We also do a bloody good vegetarian alternative and can make special dishes for any of your guests with strict dietary requirements. That’s why our clients are such big fans, because we do it all, it’s far from a one-man show, the pig is lip smacking understood, but so are the other spit options, and so are the canapés, the starters, desserts and everything else in between. The chefs at Spitting Pig are multi-talented and can make five-star food for corporate, party, wedding, or any other occasions.